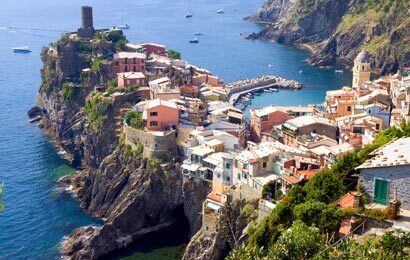 Your Driver both take you to La Spezia where you meet your guide board a local train and wind through this section of the Italian Riviera. You arrive at Town 1, Riomaggiore and take a 30-minute stroll along the "Lovers Walk" to town 2, Manarola. Here you board a boat with the locals and cruise past town 3, Corneglia, and town 4, Volastra, then dock at town 5 Vernazza (the only Cinque Terre town with a port) for a seaside lunch. After lunch, you are refreshed and ready for a casual 2-hour hike with your Lecture-Guide to the port city of Monterosso al Mare where your driver picks everyone up and heads home. You return to Florence with a glow of accomplishment, ready for a well-deserved restful evening.